Black people are not safe. Latino people are not safe. People of color are not safe. Autistic people are not safe. People with Disabilities are not safe. And heaven help you if you fall into more than one of those categories, or are also LGBTQ+ or otherwise a member of a marginalized group. You can read. And listen. And learn, and then share what you've learned with people who have the ability to change things. To that end, we're compiling the thoughts, writings, and actions of people who share the experiences of Mr. Kinsey and Mr. Rios, Mr. Rios's family members, and other community activists -- including solutions for law enforcement officials who support autistic and disabled people in crisis. It sickens me that many of us are relieved, even "grateful" in this situation. Rinaldo*, a brown autistic individual who was unable to comply with the shouted demands of the rude officer, could easily be dead right now; his autistic mannerisms and movements could have easily been misinterpreted as a threat - just as his toy truck was mistaken for a "gun." (Because you know how much trucks resemble guns.) As a mother of black children with disabilities, including processing delays, who can't always comprehend nor comply with instructions - especially in the midst of a chaotic situation and when someone is shouting loudly at you - I am frightened as well as angry. Rinaldo could easily, easily be a hashtag right now. "All I hear from the news is how my brother was holding a gun; He wasn't. How my brother was blocking traffic; He wasn't. How my brother ran away from the group home; he didn't. How my brother was suicidal; how ignorant! He wasn't. "He was walking with his caregiver. With his toy truck. "Now I hear the police saying how they wanted to shoot my brother and not Mr. Charles. As if THAT makes the whole situation better. And if that was the case, how come they handcuffed Mr. Charles while he was bleeding from the bullet wound? Also handcuffed my brother. Leaving my brother inside the police car for 4 hours despite all the staff members from the group home informing the police that Arnaldo was Autistic. Instead they just read the "rights" to him. "Now Arnaldo is in Aventura Hospital in the Behavioral Unit. He keeps having frequent episodes of screaming, intense fear and flailing while still asleep. Asking for Charles, crying." "My heart has been sinking at each incident of black men and women dying at the hands of police, and this latest video has combined a national nightmare of an epidemic of unaccounted-for black deaths with my personal one as a parent of a disabled soon-to-be adult. I can hear in Charles Kinsey’s voice how worried he is about keeping Rinaldo* safe. So why did the police see something so different?" "[Going to IHOP with my family] might not seem like anything significant, and perhaps if the current climate around race and policing in this country were different, it wouldn't be. 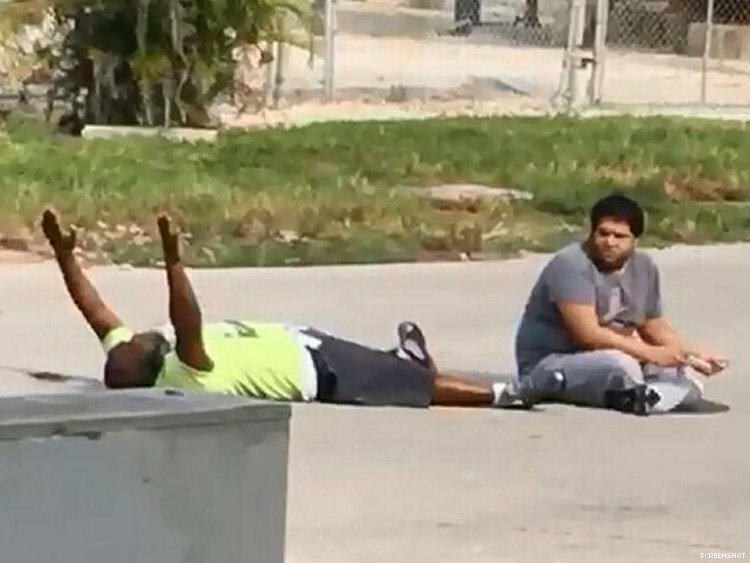 Yet on a morning when I've read the news about behavior therapist Charles Kinsey being shot by Miami police while helping a Latino autistic youth who was playing with a toy truck, it is -- at least for me. It's significant because the fear that grips me when I read that a man with his hands up while laying on the ground was shot anyway tells me to just stay home. It triggers my anxiety and panic and attempts to sell me the lie that just staying inside the house or telling my boys they can live in our home forever, where it's safe, will keep us alive ... and some days I just allow myself to believe it and exist in that delusion to safeguard my mental health until I feel bearing the weight of reality is doable again. It's a gravity well there is no climbing out of, only existing in, and being at the mercy of, while also fighting to thrive in spite of dwelling there." "It baffles me to know that the people we trust to protect us are still not fully prepared to handle every situation presented in front of them accordingly. This is just one of many incidents where law enforcement isn't properly trained to deal with the special needs community. I myself have encountered glances and awkward looks while out in the community with my client by law enforcement not knowing why he made a vocal noise which is a way of communicating. It's always in the back of my mind that one day a bystander or an officer might act upon this not knowing why my client is doing this. "To learn of this shooting incident of a man being shot while being out with his client does hit close to home. To hear that the police officer was actually aiming for his client makes me fear for my clients while being while out in the community. I've been doing this for fourteen years, and it saddens me to know that there is still little progress with regard to people of authority, specifically those with lethal weapons readily accessible, that fear due to lack of knowledge or understanding towards certain populations are still reactive versus proactive." "Racial justice advocates and communities of color have long called for better police accountability and urged reforms in crisis response practices. We urge the disability community to bring the full weight of our support behind them. The time to act is long past." "You can't train away racism or ableism. Understand that. What we need to look for are paths to reduce creating situations where these encounters take place meaning exploring solutions like a crisis team response group of medical, mental health, and autism professionals which would only include law enforcement (armed with a taser NOT a gun) if abuse of the disabled person or the threat of harm is truly imminent. All strategies need to be inclusive of autistic disability rights activists because they are both directly impacted by whatever training strategies, policies, or actions happen in their name, and they know what training and delivery methods will work best for their peers." We also urge law enforcement officials to observe the approach of officer Tim Purdy, who was dispatched to support a young Black autistic man who had left his campus, had a reported history of violence, and was possibly suicidal: Officer Purdy took the time to build a connection with the young man, sat on the ground with him on his level, and treated him like a human being. That last part is essential if we are to make progress in this area. We sincerely hope Arnaldo Rios gets to leave the hospital soon, and that Charles Kinsey makes a full recovery. Arnaldo's mother Gladys Soto has asked publicly that the community pray for her son, as the family needs lots of strength. We will be certainly keeping Arnaldo, the Rios Soto family and Charles Kinsey in our thoughts. *Early news reports identified Arnaldo Rios as "Rinaldo."